That is one chunky smallie. 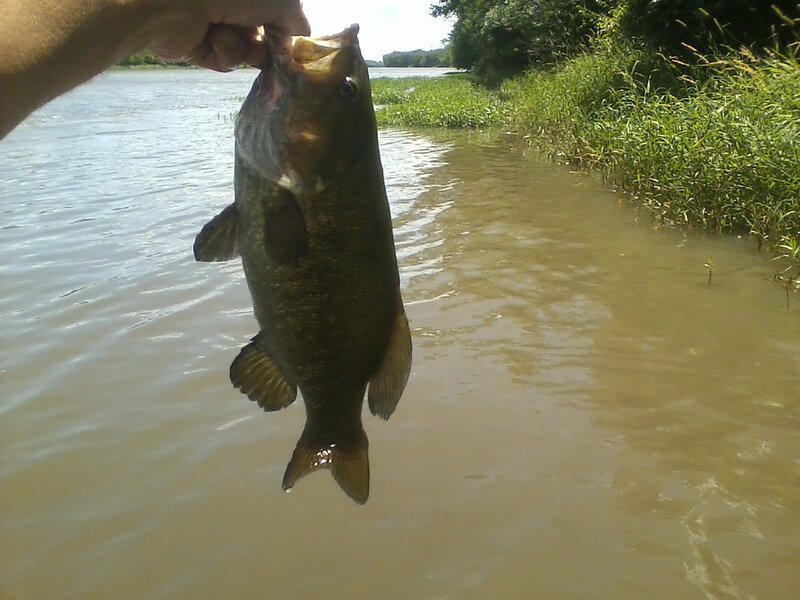 This is a high water smallmouth from a couple years ago from the Kankakee. I feel pretty comfortable fishing high water it seems as though the majority of the fish population is within 5' of the shore or less, especially if it stays that way for weeks. If the water is high and warm above 50-60 degrees you can move pretty fast. I mostly fish weedless tubes in dark colors or a spinnerbait. When the water first comes up the fish probably eat a lot. With the rising water the water temperature drops slowing the fishes metabolism. This is when a lot of people show up and catch nothing. If the water stays high the fish have to eat they adjust. Alot of easy food is up against the bank out of the strong current the big fish are there to take advantage of it. A big river like the Kankakee or Fox is easier to fish in high water because shoreline acess is easier. To work the small creeks by my house it's uphill, down hill, private property very tough. I do pretty good with a kayak on my creeks. It's jammed right against the bank often fishing small eddies. Road bridges usually have a good eddy on the down stream side you can just bridge hop. One thing is that the fish in these high water eddies have to come from somewhere. I was really puzzled doing so poorly in some great looking high water eddies on the Kankakee. When I checked these spots in the summer the middle of the river was only a foot or so deep. If you know a good summer pool, in high water the fish just move out of the flow towards the bank. It's kinda neat to catch fish where you were walking the week before. That's all for now. Looks like prime smallmouth habitat! I sometimes do a Plan A, Plan B trip. I fish some high muddy water if I can't get nothing going then I fish some lower clear water. You can check the river gauges to find cleaner water. Often on the Kankakee the state park is muddy but if you get above the Iroquois its nice and clear. Also the smaller feeder creeks mud up sooner but they also clear faster. Great info, Phil. Something I can add to the discussion is that I have had my five best days on the Kankakee fishing up in the creek mouths when the river is high ,muddy and rolling and the creek itself has already dumped it's water into the river and starting to clear. It's almost like most of the smallmouth (and walleyes as well) that are normally spread out in the main river find their way in there, becoming highly active on crankbaits. Has to be timed just right, but it is a great pattern. That reminds me of fishing our neighbor hood pond when it rains hard it's as if every fish in the pond is in front of the incoming drain. Thanks for the tip on creek mouths. On some of the creeks near me there are two populations of smallmouth. One migrates into the feeder creeks to spawn and stays as long as the water remains high. If it's a rainy high water summer they stay till fall. lots of big smallmouth in a small creek. The other s are residents and stay all year. These resident fish are in the deeper pools and also way upstream from the bigger river, 10+ miles sometimes. The creeks are very small but have some deep spots. You can catch these fish here in the winter where as the lower stream fish have migrated to the big river for the winter. These small creeks clear much faster then the big rivers so they are always an option when everthing is flooded. I have one section of river by my house that's muddy and full of wood. Classic carp- catfish water. The water is always muddy from the carp working. There's also a great smallmouth population. There's some good spawning water 10-15 miles upstream and there are some gravel and rocky areas where the river hits the base of the river bluff. Unless you wade or drop an anchor you'd miss the rocks. 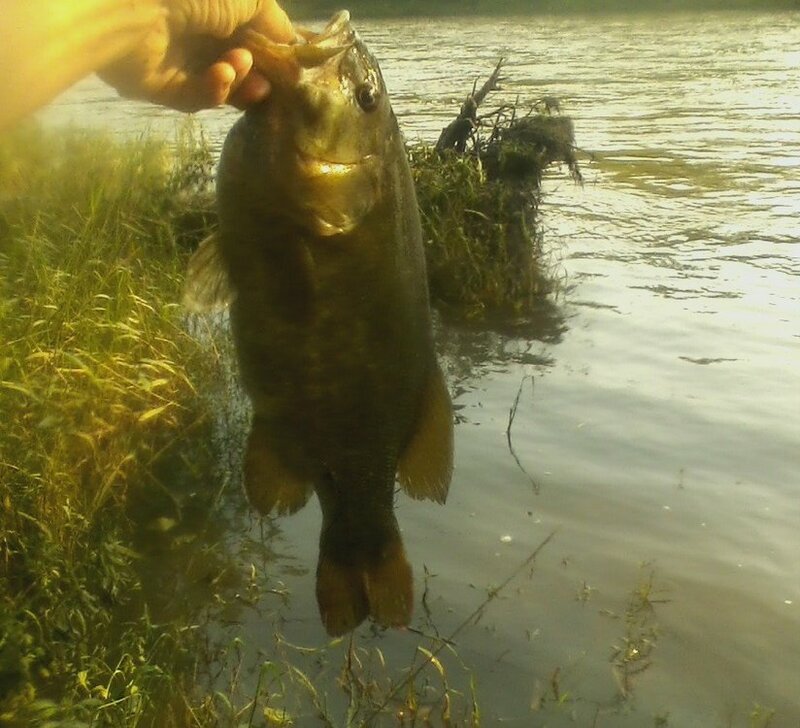 So these smallmouth don't really notice when the river gets muddy they're use to it. The deep wood filled holes also provide great winter habitat too. I normally fish the Fox and love high water fishing. Easy to find numbers and size most of the time. Spots can get picked over pretty quick because the easy access / easy fishing is no secret. It’s also neat how a different look can make all the difference in pressured areas. A lot of folks think small, yet a larger (heavier) lure offers much more control ... whether pinpoint dabbling, fluttering, or working angles. When in urban areas, casts are rarely needed. The workspace is minimal. I’ve done a few long float trips on the Dupe during high water. Mostly pinpoint spinnerbait fishing. 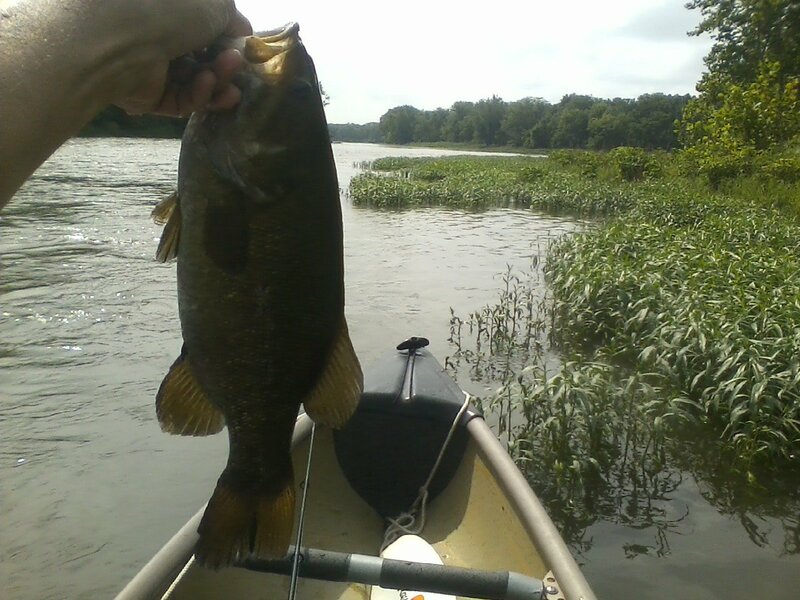 Didn’t get numbers, but every smallie I connected with was of respectable size. It ain’t for everyone. There’s much planning and some risk on paddling and fishing high water. It’s something best worked up to incrementally to gain confidence and understanding. John have you ever tried to find them out in the illinois? I’ve spent some time on the Wanash in Indiana looking for wintering fish never found much out. I Probably could use a bigger boat. I did hear of some catfish guys getting some smallmouth on the wabash in the winter.